The objective of this study is to characterize and quantify the “trans-spatial nexus synergy” benefit of subsidized water ponding in the water-energy-food nexus in Kumamoto, Japan. After years of decreased rice production in upstream areas and associated declines in groundwater levels, the Kumamoto city government implemented a subsidy program whereby farmers in the Shira River basin receive payments to water their fields, which provides valuable groundwater recharge to downstream Kumamoto city. We quantify the economic benefits of this subsidy program, which include avoided additional energy costs to obtain scarcer levels of groundwater, as well as net revenue from the crops in the Shira River basin that would otherwise not be grown in the absence of the subsidy. These annual benefits can be combined and compared to the annual cost of the government subsidy. We also calculate potential historical losses that may have occurred in the region as a result of land use transitions from rice farming to urban use, which disrupted the nexus synergy between the watered fields and the groundwater table. Water, energy, and food are fundamental resources, management of which are key for sustainable societies. Increases in population and changes in lifestyle put pressure on demand for water, energy, and food, which are expected to increase worldwide by 55, 80, and 60% in 2050, respectively (IRENA, 2015). These linked and interdependent resources make up the water-energy-food nexus, one of the most important global environmental and sustainability issues threatened by climate and societal changes (Hoff, 2011; Future Earth, 2014; Daher and Mohtar, 2015; Mohtar, 2015; Taniguchi et al., 2015; Mohtar and Lawford, 2016; Van Vliet et al., 2016). According to the Global Risks 2015 report (World Economic Forum, 2015), water, energy, and food have high global risks in terms of both likelihood (>4.5 on a scale from 1 not likely to 7 very likely) and magnitude of impact (>4.75). Therefore, analyses of the three resources to better understand the synergies and tradeoffs among the water-energy-food nexus are key to a sustainable society given increasing demand for these resources. Connections between production and consumption within the water-energy-food nexus typically fall into one of three distinct categories. The first type involves the consumption of one resource to produce other resources. This is sometimes referred to as a direct “tradeoff” within the nexus. For instance, shale gas extraction requires fracking water, which cannot be reused (Taniguchi et al., 2017). Similarly, agriculture requires water, which also cannot be reused after food production. The second type of relationship can be described as an “alteration/interaction,” wherein resources interact with each other, but each resource is changed, rather than consumed, after producing other resources. Water use for cooling power generation is one example of this second relationship. Water (volume) itself is not consumed but water temperature is changed after cooling. Another example is hot spring power generation (Taniguchi et al., 2017), in which only water quality (temperature) is changed after water use for energy production. The third type of relationship is the “linkage” between water, energy, and/or food, which is defined here as the “synergy” of the nexus. In this case, each resource is not necessarily consumed nor changed after producing other resources. Within the “linkage” relationship, there are conceptually also three different types of ideal “synergies” of the water-energy-food nexus. The first one is contemporaneous place-specific synergy including efficiency increases via the nexus, such as the cascade use of water for energy and food production (reuse of geothermal energy water discharge for the production of greenhouse agriculture, for example). The second one is trans-spatial synergy which creates synergy of the nexus using connectivity of different spatial scales, such as trans-boundary resources management. The third one is trans-temporal synergy of the nexus, which creates synergy related to the trans-temporal scale of past-current-future connectivity, where future generations' preferences are considered. This study focuses on the second type of synergy of the nexus, “trans-spatial synergy,” in Kumamoto, Japan (see Figure 1), where groundwater is the primary source of drinking water. Historically, rice farmers in the region upgradient of the city's most heavily used aquifer, have contributed to recharge via surface water irrigation. However, after years of decreased rice production in the upstream areas and increased urbanization and industrialization, concerns about mounting groundwater scarcity have led to the development of a multi-municipality trans-spatial collaboration. Figure 1. Map of Kumamoto City and its primary underlying confined aquifer. (Left) Map showing research setting. (Right) Map showing well locations. Rather than developing expensive groundwater alternatives to combat growing freshwater scarcity, the Kumamoto city government, through collaboration with numerous stakeholders, determined that a managed aquifer recharge (MAR) program would likely be more cost-effective. In addition to increasing the volume of stored groundwater to support sustained resource use, MAR can provide numerous benefits including drought resilience (Scanlon et al., 2016) and water quality improvement (Maliva, 2014). MAR programs can sometimes be hampered by a clear economic case for implementation, however, especially when construction and operation of costly infrastructure is required (Arshad et al., 2014; Maliva, 2014). The case of MAR in Kumamoto is unique in that it is particularly suitable for financing using a payment for environmental services (PES) mechanism; a PES scheme is generally defined as a voluntary, conditional agreement between at least one seller and one buyer over a well-defined environmental service (Wunder, 2006; Engel et al., 2008). Ultimately a potentially win-win offsetting scheme was devised, wherein large groundwater users in Kumamoto City agreed to pay farmers in the Shira river basin to flood their fields (Shivakoti et al., 2018). Ongoing since 2004, the Kumamoto program is touted as one of the few successful PES schemes for groundwater recharge-based natural infrastructure solutions worldwide (Shivakoti et al., 2018). Thus, there is no need to assess the sustainability of the already proven approach. Rather, the main goal of the current study is to characterize the synergistic implications of the subsidized water ponding program in the water-energy-food nexus in Kumamoto. To that end, we quantify the economic benefits of this subsidy program, which include avoided additional energy costs to pump scarcer levels of groundwater, as well as net revenue from the crops in the Shira River basin that might otherwise not be grown in the absence of the payments received by farmers. These annual benefits can be combined and compared to the annual sum of payments made by groundwater users. We also calculate historical nexus synergy losses that occurred in the region prior to the implementation of the subsidy program, where total annual synergy loss is defined as the sum of farmer synergy loss and pumping synergy loss, farmer synergy loss is calculated in each year as the difference between maximum farm income observed during the study period and contemporaneous income, and pumping synergy loss is calculated in each year as the difference between minimum pumping cost observed during the study period and contemporaneous cost. All data and calculations are available in Supplementary Table 1. Kumamoto City (Figure 1) is the capital of Kumamoto Prefecture on Kyushu Island, Japan. Freshwater needs of the city's 730,000 inhabitants are met entirely by groundwater. Therefore, residents are mindful of the need to protect the underlying aquifer system for current and future generations. The Kumamoto groundwater area (indicated by the red line in Figure 1) is bounded by the Shira River watershed to the north, the Midori River to the south, the Ariake Sea to the west, and the outer mountains of Aso caldera to the east (Hosono et al., 2013). The aquifer system consists mainly of volcanic pyroclastic deposits, porous lavas, and alluvial deposits that overlie the hydrogeological basement of Palaeozoic meta-sedimentary rocks and Pliocene to Quaternary volcanic rocks (Hosono et al., 2013). Highly permeable volcanic pyroclastic deposits form highlands (elevation ~200 m above sea level) around the plain area (elevation ~10 m above sea level), creating a region of high recharge potential for the entire aquifer system (Taniguchi et al., 2003). There are two major aquifers, an unconfined aquifer (ca. <60 m in depth) and underlying confined aquifer (ca. 70–200 m), separated by an impermeable lacustrine aquitard. However, this aquitard layer becomes discontinuous under the mid-stream region of the Shira River (see its location in Figure 1), allowing surface water to directly recharge the deep confined aquifer (Shimada et al., 2012) in that area. In general, groundwater in both aquifers flows following the topographical slope (Figure 1), recharging in the highlands and mid-stream region of the Shira River, then flowing laterally south- and westward (main flows are shown by the blue arrows in Figure 1), and mostly discharging within 40 years as springs in Lake Ezu (Taniguchi et al., 2003; Hosono et al., 2013; Ono et al., 2013; Kagabu et al., 2017; Okumura et al., 2018). Hydrochemical evolutions and issues regarding contaminations are reported in previous papers (Hosono et al., 2013, 2014; Hossain et al., 2016a,b). Groundwater from the confined aquifer is the major source of drinking water for the citizens of Kumamoto City (Figure 1). Paddies for artificial water ponding are allocated within the mid-stream region of the Shira River in administrative boundaries of Ozu and Kikuyo towns (within the pink circle in Figure 1) as the recharge rates have been documented to be very high (Hosono et al., 2013), and most groundwater users are concentrated in central Kumamoto City, (Figure 1 and see Hosono et al., 2013 for detailed land-use pattern) downslope of the groundwater flow systems. Groundwater levels have declined in the decades leading up to the early 2000s (Figure 2), due largely to a shift from agricultural to urban land use in key recharge areas (Shimada, 2010). As a result, the Kumamoto prefecture and city governments have worked together in recent years to develop policies aimed at enhancing recharge, including setting aside a proportion of urban zones as “green” to allow for recharge in areas that would otherwise be developed, mandating installation of rainwater infiltration tanks and equipment in certain buildings and greenhouses, and providing water ponding subsidies to local farmers in areas upgradient of the Kumamoto City aquifer system. While there are rivers in the area, groundwater is the preferred water source due to the high permeability in the study area, groundwater's seasonal stability (against drought, etc. ), groundwater's superior water quality (Hosono et al., 2018), and the prohibitive infrastructure costs associated with capturing surface water. In this study, we focus on the potential benefits and costs of the water ponding subsidy program. Figure 2. Groundwater levels (m.a.s.l.) and precipitation (mm/year) over the period 1982–2017 at three observation wells in Kumamoto (see Figure 1 for well locations). The vertical dashed line denotes the start of the subsidy program. By tracing stable oxygen isotopic compositions, Shimada (2010) identified the mid-stream region of the Shira River as a key recharge area for Kumamoto City's primary aquifer (Figure 1), located at the intersection of Ozu and Kikuyo town boundaries, and northeast of Kumamoto City Proper. Given the transboundary nature of the groundwater system, effective water management strategies for the region require coordination and cooperation between local and prefectural governments. In 2004, Kumamoto City government introduced a financial assistance program to encourage farmers in the mid-stream recharge area, including Kumamoto, Ozu, and Kikuyo to flood fallow rice paddies with river water in order to recharge the groundwater system underlying Kumamoto City. Over the period 2004–2017, an average of 456 farmers participated in the program annually, 4.6 million m2 of paddy field area was watered per year, 48.6 million JPY (427,921 USD) was paid in subsidies per year, and an estimated 13.7 million m3 of recharge was captured annually (Figure 3). Recharge was estimated assuming that 100 mm of river water is applied daily for 30–90 days per year over the total paddy field area, which translates to an effective recharge rate of 3–9 m3 per year for every 1 m2 of paddy field area watered. Note that the sudden drop in all subsidy program-related indicators (number of farmers, subsidy level, watered area, and recharge gain) in Figure 3 are due to the Kumamoto inland earthquakes which started by a large foreshock of Mw 6.2 on April 14 2016, followed by the main shock of Mw 7.0 the next day (e.g., Hosono et al., 2018). These earthquakes caused serious damage to infrastructures and surface- and subsurface lands including agricultural farm land and its irrigation system. Administrative functions including water ponding activates were not effective in 2016. Today, the water ponding program is now an important component in meeting total water demand in the area. Flooded fallow paddies have offset around 2 million m3 and 12 million m3 of the annual groundwater demand for industries and the Kumamoto City water supply, respectively, totaling ~13% of total water demand in Kumamoto (Shivakoti et al., 2018). Figure 3. Summary of Kumamoto water ponding subsidy program over the period 2004–2017: (A) number of farmers participating in the program, (B) total of all subsidy payments by year, (C) total paddy field area watered as a result of the program, (D) estimated recharge gain attributed to the program. In resource economics, groundwater pumping costs are typically modeled as an increasing function of lift, that is, the greater the distance between the ground surface and the water table, the more expensive to pump (Gisser and Sanchez, 1980; Feinerman and Knapp, 1983; Brill and Burness, 1994; Krulce et al., 1997). Under this assumption, the cost to raise a given volume of water from the aquifer to users at the surface is lower when the water level is higher. Therefore, if the Kumamoto water ponding subsidy program increases water levels over time, or at least avoids reductions in water levels that might otherwise occur without the subsidy, then the program generates a benefit equal to future pumping cost savings. While we have estimates of recharge gained as a result of the subsidy program (Figure 3D), translating that volumetric change to spatially distributed changes in lift is challenging for a number of reasons. Although much of the Kumamoto aquifer recharge comes from the mid-stream area, the exact proportion is uncertain. Moreover, while groundwater travel time from the unsaturated zone in the upgradient recharge area to the downgradient pumping wells in Kumamoto city is not well understood but somewhere in the range of 40 years (Kagabu et al., 2017), the significant pressure due to the volume of groundwater allows us to consider this connection directly as the pressure-driven hydrological response occurs spontaneously in the saturated zone and within 1 year in the unsaturated zone. Bearing in mind these substantial uncertainties, we elected to estimate the pumping cost benefit of the subsidy for a range of hypothetical changes in groundwater levels over the next 20 years. While the numbers are meant to be illustrative, the range captures what we believe to be plausible aquifer responses, given the size of the subsidy program. Over the period 1982–2004 (prior to the subsidy program), water levels declined on average by 0.02, 0.24, and 0.14 m/yr at Suizenji, Kikuyo, and Mashiki observation wells respectively. In the years following implementation of the program, water levels have steadily trended upward, which suggests that the program contributed toward offsetting the decline prior to 2004. We specified a baseline effect of the subsidy on water level of 0.1 m per year, based on the assumption that the program provided just enough recharge to counteract the average annual water level decline leading up to 2004. We also estimated pumping cost benefits for subsidy impacts of 0.2 and 0.3 m per year to consider the possibility that the program was more effective in contributing to the observed reversal of the water level trend. 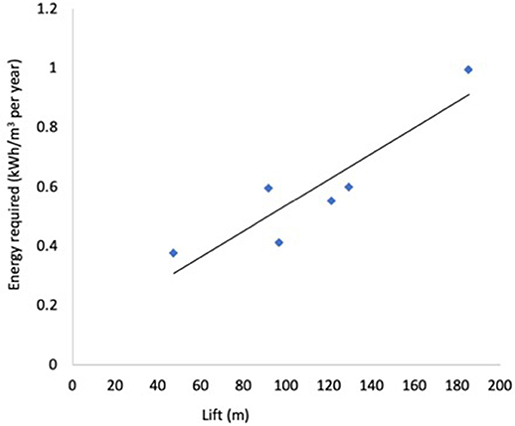 Pumping data from six wells (Muro, Okino, Horikawa, Hirakawa, Tsutsujidai, Takaono) from Ozu Waterworks were used to estimate a relationship between energy expenditure and lift (Figure 4). A linear fit (R2 = 0.8241) generated a slope of 0.0044, which means that a 1-m increase in lift increases the total energy required for pumping groundwater to the surface by 0.0044 kWh/m3. The annual change in energy demand for each of the three recharge scenarios was then multiplied by the average price of electricity across three pumping wells in Kumamoto City (Kengun PW-6, Shoguchi PW-8, and Takuma PW-10), inferred from electrical power consumption and electricity expenditure data. Because water levels are not measured in pumping wells at our study site, lift was calculated using observation well data matched to pumping wells based on proximity: Suizenji OW-1 was matched with Kengun PW-6 and Shoguchi PW-8, Kikuyo OW-5 was matched with Takuma PW-10, and Mashiki OW-10 was matched with Mashiki PW-3,4,5,9 (Figure 1). Pumping wells were selected based on current knowledge about the flow path of groundwater recharging from the mid-stream area (Shimada, 2010), where the subsidized ponding is occurring. Lastly, the unit change in energy cost was multiplied by the average (over the period 2012–2016) annual volume pumped, totaled across the seven pumping wells, to estimate the total annual pumping cost savings generated by the subsidy program. To test the sensitivity of the results, we also considered scenarios wherein pumping increased/decreased by 1 million m3 and the price of electricity increased/decreased by 0.5 JPY/kWh (0.004 USD/kWh) annually over 20 years. Figure 4. Estimated relationship between energy for pumping groundwater and lift in Kumamoto (R 2 = 0.8241). Farmers in Ozu and Kikuyo towns—in the mid-stream area of the Shira River where the largest volume of recharge occurs—who receive financial assistance through the artificial recharge program are required to water empty rice paddy fields 30–90 days out of the year. A condition of the water ponding assistance program is that the paddy is not producing rice at that time, in accordance with the national government's long-standing rice production control policy which has led to declining production since the 1960s (Lee et al., 2018). During the remainder of the year, however, farmlands can be used to grow crops, which support farm households. For some families, farming would be unsustainable without the financial assistance program, given increasing production input costs, a shift in the local economy toward other industries, and an aging population (Ministry of Environment Japan, 2015; Shivakoti et al., 2018). Because we do not know the specific dependency of farm income on this subsidy program, a range of avoided loss of farm income in Ozu and Kikuyo towns was included as a benefit of the subsidy program. Over the period 2004–2014, the number of households that reported farm income ranged from 460–864 to 362–559 per year in Ozu Town and Kikuyo Town respectively. During that same period, the number of farmers participating in the subsidy program ranged from 138 to 549 per year, increasing annually from 2004 to 2007, remaining fairly constant through 2012, and declining thereafter (Figure 3A). Assuming that participating farmers were distributed in proportion to the total number of farmers who reported income in each town (likely an underestimate as most participating farmers come from these two towns), avoided farm income loss was calculated for Ozu and Kikuyo each year by multiplying the inferred number of participating farmers by average farm income per household. Total avoided income loss ranged from a low of 1.4 billion JPY (12.3 million USD) to a high of 3.2 billion JPY (28.2 million USD) per year. The average value of 2.4 billion JPY (21.1 million USD) was used to estimate the annual avoided income loss over 20 years in our baseline scenario. To test the sensitivity of the net benefit calculations to the farm income component, we also ran scenarios using 25 and 50% of the baseline value of avoided income loss. This allowed us to consider the possibility that some farmers would still be cultivating non-rice crops without the payment scheme, in which case 100% of farm income should not be attributed to the program. The water ponding subsidy program, which is operated by the Kumamoto City government, is funded from a combination of public tax revenue and private sources with interests in supporting the water resource, including for example Suntory, a Japanese brewing and distilling company. In general, the success of a PES program hinges on the development of an appropriate financing platform that generates a continuous flow of financial resources to fund payments over the long term (Mayrand and Paquin, 2004; Roumasset and Wada, 2013; Schomers and Matzdorf, 2013). This flow may be supported by direct payments from beneficiaries, government payments, and/or donations and grants from non-governmental organizations. In the case of Kumamoto, diversifying payment sources increases the ability of the program to sustain long-term financing, but it also potentially introduces some additional costs. For example, in addition to the direct cost to the public of supporting the payments, the program likely generates some excess tax burden—the welfare cost of raising extra revenue from an already existing distorting tax (Stuart, 1984; Ballard et al., 1985). The program also incurs some limited administrative costs (employs 1.5 FTE annually and <1 FTE between May and October to administer and monitor the program), as well as costs related to public outreach and education. Here we focus only on the direct revenue requirement, so our results underestimate the full cost of the program. The average value of subsidy payments over the period 2004–2017 (Figure 3B), estimated at 48.6 million JPY (427,921 USD) per year, was used to project the cost of the subsidy over 20 years. Total benefits of the program were calculated as the sum of avoided pumping costs and avoided farm income losses, while total costs included the revenue required to fund the program payments. Annual net benefit—the difference between total benefits and costs—was then projected over 20 years for different combinations of model assumptions. 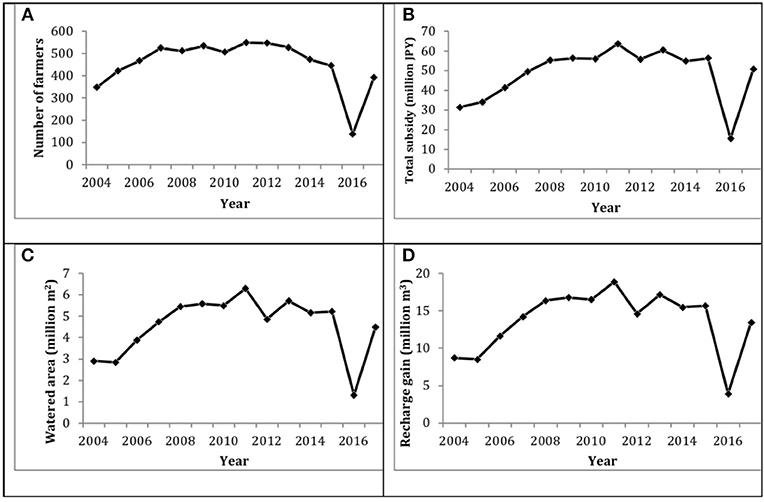 The positive impact of recharge on water levels was varied from a 0.1 to 0.3 m/yr, based on the trend of declining water levels prior to program implementation. At the three observation wells, water level declined by an average rate of between 0.02 and 0.18 m annually over the period 1982–2003. Electricity costs may increase or decrease over time, particularly as renewable sources continue to become more cost-effective. Over the period 1982–2017, the unit cost of energy declined across the three Kumamoto pumping wells by between 0.18 JPY/kWh (0.0016 USD/kWh) and 0.25 JPY/kWh (0.0022 USD/kWh) annually. Thus, we considered the cases of electricity costs changing by ±0.5 JPY/kWh (0.0044 USD/kWh) per year. We also varied assumptions on future consumption needs (±1 million m3 pumping/yr), and avoided farm income losses equal to 25 and 50% of the baseline value of 2.4 billion JPY (21.1 million USD) per year. The water ponding program also allows farmers to continue production of local crops in the area, which has additional benefits in terms of energy offsets from avoided transportation and energy expenditures from outside the region. The region's local production of rice, watermelon, melons, tomatoes, etc. is highly valued and is another beneficial component of the nexus synergy between the water ponding program and Kumamoto's groundwater supply. In addition to projecting net benefits of the subsidy program into the future, we calculated total synergy losses over the period 1982–2016 in terms of both pumping costs and farm income. Note that groundwater levels may have started to decline prior to 1982, but due to limited data availability, our calculated synergy losses are likely conservative estimates. Pumping cost losses were estimated by first taking the difference between contemporaneous head level and maximum attained head level over the period 1982–2016. That difference was then converted to a change in energy via the energy requirement function (Figure 4) and multiplied by the contemporaneous unit cost of electricity and pumping volume. The resulting change in nominal pumping cost was then converted to 2018 JPY values and aggregated across years. Farm income losses were calculated by first converting nominal income to 2018 JPY values and identifying the maximum inflation-adjusted income value over the period 1982–2016. Annual synergy losses were then estimated as the difference between current year income and maximum income, and the total loss was calculated by summing annual losses. We find that total net benefit of the water ponding subsidy program, aggregated over a 20-year management period, ranges from 11.19 billion JPY (98.5 million USD) to 47.72 billion JPY (420.2 million USD) across 21 scenarios (Table 1)—seven sets of pumping benefit assumptions crossed with three sets of farmer benefit assumptions. The variation in outcomes is driven almost entirely by the assumptions underlying avoided farm income loss estimates. In other words, for a given farmer benefit level, net benefit remains relatively unchanged as pumping benefit assumptions (rows in Table 1) are varied. Whereas, for a given set of pumping benefit assumptions, net benefit varies substantially as farmer income benefits (columns in Table 1) are varied. Table 1. Net benefit of Kumamoto water ponding subsidy program over 20 years under different assumptions about avoided pumping costs and farm income losses. Our results suggest that the subsidy program is generally favorable, provided that the financial assistance continues to promote the generation of farm income in Ozu and Kikuyo towns in the future. If the payments are not enough to incentivize households to continue farming, then the net benefit of the program will decline, and possibly even become negative. The nexus synergy losses in the years leading up to implementation of the subsidy program have been substantial. Increased pumping costs due to decreasing head levels were estimated at 61.4 million JPY (540,354 USD) over the period 1982–2003. Farm income losses (relative to the maximum observed income level) totaled 116.4 billion JPY (1.02 billion USD) over that same period. Although returning to historical synergy levels may not be realistic given additional external factors affecting head levels (e.g., changing rainfall patterns due to climate change or more impervious surfaces due to increased urbanization), the subsidy program will help to mitigate some of the synergy losses moving forward. Aside from the direct benefits of the water ponding subsidy program measured here, there are several additional values of Kumamoto's groundwater supply that we do not attempt to quantify or monetize, but add to the social value of this system. First, the source of much of Kumamoto's groundwater discharge, Lake Ezu (see Figure 1 for its location), is a symbol and icon for Kumamoto citizens and visitors. Without Lake Ezu's contribution to groundwater, aquifer head levels may be lower by almost 5 m, resulting in additional pumping costs of nearly 10 million JPY (86,140 USD) annually over our 20-year planning horizon. And as a cultural symbol of Kumamoto, 500,000 tourists visit Suizenji Gardens each year, bringing in roughly 7 billion JPY (61.6 million USD) to the Kumamoto visitor industry annually (Kumamoto City, 2017). Finally, without access to Kumamoto's groundwater supply in the future, alternative water sources such as dam systems built upstream of Shira River may be necessary (including additional water treatment), costing on the order of several trillion JPY. Ensuring the continued nexus synergy between upland farmers and downstream groundwater recharge also helps secure stable water availability into the future, avoided costs of which may be significantly higher than the avoided future pumping costs discussed here. MT, KB, and JS: motivation and framing for the project; CW and KB: economic analysis and writing; MT, JS, and TH: environmental and hydrologic analysis and writing; CW, JS, TH, and KI: figure and table development; JS, TH, and KI: data collection, map development, background research, and information. This research was supported by Research Institute for Humanity and Nature (RIHN: a constituent member of NIHU) Project No. 14200097, entitled Human-Environmental Security in Asia-Pacific Ring of Fire: Water-Energy-Food Nexus. We thank the government offices of Ozu-Kikuyo Waterworks, the Ozu and Kikuyo branch of the National Federation of Land Improvement Association, Kumamoto City, and Kumamoto Prefecture for kindly providing water level and pumping cost data. Supplementary Table 1. All data used in the analyses (head levels, precipitation, pumping rates and costs, subsidy information, recharge, and farmer income), net benefit scenarios, and synergy loss calculations. Ballard, C. L., Shoven, J. B., and Whalley, J. (1985). General equilibrium computations of the marginal welfare costs of taxes in the United States. Am. Econ. Rev. 75, 128–138. Hoff, H. (2011). “Understanding the Nexus,” in Background Paper for the Bonn2011 Conference: The Water, Energy, Food Security Nexus (Stockholm: Stockholm Environment Institute). IRENA (2015). Renewable Energy in the Water, Energy & Food Nexus, International Renewable Energy Agency. IRENA. Kumamoto City (2017). Tourist Statistics 2017 in Kumamoto City. Kumamoto. Mayrand, K., and Paquin, M. (2004). Payments for Environmental Services: A Survey and Assessment of Current Schemes. Montreal, QC: Unisféra International Centre. Shimada, J. (2010). “The transboundary management of groundwater resources in Kumamoto, Japan,” in Sustainability Science for Watershed Landscapes, eds J. A. Roumasset, K. M. Burnett, and A. M. Balisacan (Singapore: ISEAS Publishing), 311–326. Shimada, J., Ichiyanagi, K., Kagabu, M., Saita, S., and Mori, K. (2012). “Effect of artificial recharge using abandoned rice paddies for the sustainable groundwater management in Kumamoto, Japan,” in World Environmental and Water Resources Congress 2012: Crossing Boundaries, Proceedings of the 2012 Congress (Albuquerque), 59–69. Stuart, C. (1984). Welfare costs per dollar of additional tax revenue in the United States. Am. Econ. Rev. 74, 352–362. World Economic Forum (2015). Insight Report: Global Risks 2014, 9th Edn. Geneva. Copyright © 2019 Taniguchi, Burnett, Shimada, Hosono, Wada and Ide. This is an open-access article distributed under the terms of the Creative Commons Attribution License (CC BY). The use, distribution or reproduction in other forums is permitted, provided the original author(s) and the copyright owner(s) are credited and that the original publication in this journal is cited, in accordance with accepted academic practice. No use, distribution or reproduction is permitted which does not comply with these terms.